Use orange juice and marmalade to make the citrus sweet and sour glaze for this Chinese-inspired seafood dish. Put the shrimp in a bowl with the soy sauce, ginger and sesame oil. Let this marinate for 10-15 minutes. Prepare a paper towel lined wire rack. Add 1-inch of vegetable oil to a heavy bottomed pot and preheat to 360 degrees F (180 C). 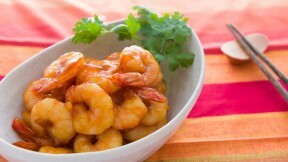 Sprinkle the potato starch over the marinated shrimp and stir to coat evenly. When the oil comes up to the proper temperature, add the shrimp one at a time frying until the shrimp has turned bright orange. Do not try to crisp the coating or the shrimp will overcook. Transfer the cooked shrimp to the prepared rack. To make the sauce, add the orange juice, marmalade and salt to a frying pan and boil the mixture until the bubbles become big and shiny, and it has the thickness of maple syrup (the real kind, not the fake kind).